The Resurrection of Jesus Christ is one of the most important events in history. It ranks right up there with the Creation and Jesus’ death on the Cross. And the Resurrection should give great confidence to true believers. Consider that when Jesus died on the Cross in 30 A.D. to provide one-of-a-kind substitutionary atonement for believers’ sins, His disciples were afraid, sad, and scattered. They didn’t understand. Yet upon seeing the overwhelming evidence of Jesus’ amazing, physical resurrection, they became confident, glad, and united. For Jesus’ resurrection confirmed that He was the God-Man, who had the ability to identify with (thus take the place of) sinful humans. 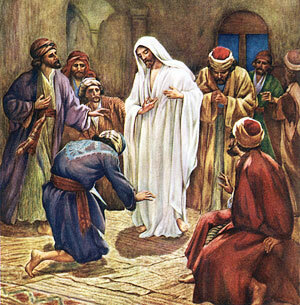 And it convincingly demonstrated that He, as the One Who had created all things (John 1:3), had divine authority to forgive sins past, present, and future for all who confess and repent of their sins, ask for and receive Jesus’ forgiveness, and submit to Him as the new King of their lives. Upon seeing that Jesus has resurrected Himself, just as He said He would, the formerly scared, hopeless, and defeated disciples were transformed in their minds, hearts, and souls. They now knew their identity and purpose. They now knew the meaning of life. And they knew the source of joy. And get this — they were willing to not only die for Jesus, but to live for Him and to suffer for Him as they produced great fruit, saw many lives changed, and turned their culture upside down. Similarly, every believer today, who sincerely entrusts himself or herself to Jesus, should be glad and hopeful, not morose and hopeless. If you, like His disciples, will gaze at the resurrected Jesus, you’ll not only realize He is Who He said He was, and how much He loves you, but you’ll discover your exciting and fulfilling Reason for being, living, and working! When He had said this, He showed them His hands and His feet. But while they still did not believe for joy, and marveled, He said to them, “Have you any food here?” So they gave Him a piece of a broiled fish and some honeycomb. And He took it and ate in their presence. Then He said to them, “These are the words which I spoke to you while I was still with you, that all things must be fulfilled which were written in the Law of Moses and the Prophets and the Psalms concerning Me.” And He opened their understanding, that they might comprehend the Scriptures.